What happens during a neurology appointment? The majority of Dr Heaney’s consultations follow referrals from GPs and other medical practitioners: in this case, you can discuss such referral with your doctor and they will be able to make the relevant referral. Dr Heaney is recognised and fee approved as an expert provider by the major insurers (including BUPA and AXA) but please check your individual insurance policy in case an excess applies or whether the policy requires a GP referral. If you need further advice, please contact his private secretary, Zara Martin. Dr Heaney is happy to see self-funding patients. His secretary can explain the likely fee schedule and costs of any investigations that might be required (please see terms and conditions). Most of Dr Heaney’s patients are seen at the QS private consulting rooms. This central location is at the site of the internationally renowned National Hospital for Neurology and Neurosurgery – which allows a wide range of specialist investigations to be pre-arranged on the same day or soon after your consultation (for example dedicated CT and MRI neuro-imaging, specialised neurophysiology and a wide range of blood testing). 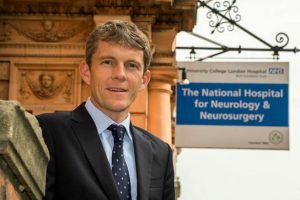 Co-location at this centre of neurological excellence offers the benefits of Dr Heaney being able to work on your case closely with a wide range of other neurologists, surgeons and array of aligned health care experts if necessary. If you are being seen at one of these clinics already, and have questions or requests in relation to your ongoing care, the PCR will be able to be of assistance.